At one time every large and medium sized city, and some small towns had one or more electronic supply stores. Electronic repair technicians and hobbyists supplied them with plenty of business. 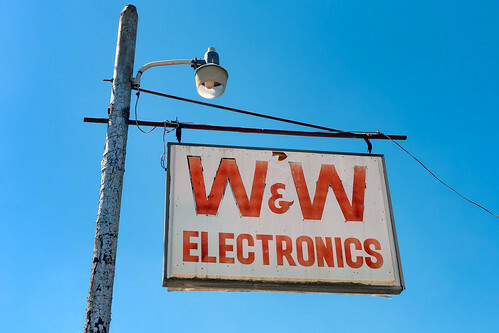 With all of the electronic manufacturing companies, electronic repair shops, electronic engineers and technicians and hobbyists in the Huntsville Alabama area, it isn't surprising that there were once several of these shops in town. For several reasons, the market for these shops slowly faded away and most have had to close. 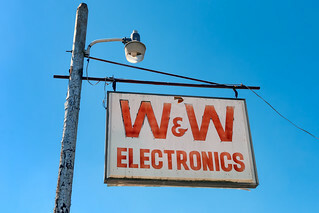 W&W on Clinton Avenue in Huntsville was one of the last holdouts and closed about five years ago, but the sign still hangs on a pole in front of the building. I still miss that place when I need an electronic component, speaker, and other electronic gadgets.